Most people use their Grand Cherokees for everything from once-in-a-lifetime adventures to daily grocery-getting, and either way that means carrying cargo. 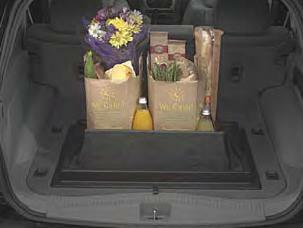 Keeping cargo in its place and organized can be a challenge, but this accessory does the job ingeniously. The adjustable cargo area tray is made of molded black plastic and attaches to your vehicle floor. Sidewalls, dividers and detachable nets create compartments to keep everything secure. The tray is easy to install and remove for cleaning and folds out of the way when not in use. It even has a Jeep logo. Get one and get organized. Secure and organize groceries, sporting goods, etc. with the reverse cargo system. Tough, durable panels mount to existing vehicle load floor. Top detachable nets provide compartments. When not in use the organizer flips out of sight. Embossed with Jeep Logo.